Although North Atlantic lobsters are caught and served up and down the New England coast, the crustacean is often synonymous with the state of Maine, where the lobster supply chain makes a significant impact on the state's economy. Those outside the New England region might crave the succulent white meat of lobster, and for that, there are Maine lobster delivery services to please palates nationwide. To get the best product possible when ordering online or over the phone, there are a few tips to keep in mind, such as choosing a delivery service that sells fresh catch and ships it properly. Although lobster season is often thought to be during the summer, the crustaceans caught during this time have softer shells. While this is fine for eating locally, it's not ideal for shipping purposes. The best time to buy lobsters for live delivery is before Memorial Day or after Labor Day, with peak season occurring between mid-September and mid-November and from April through early June. 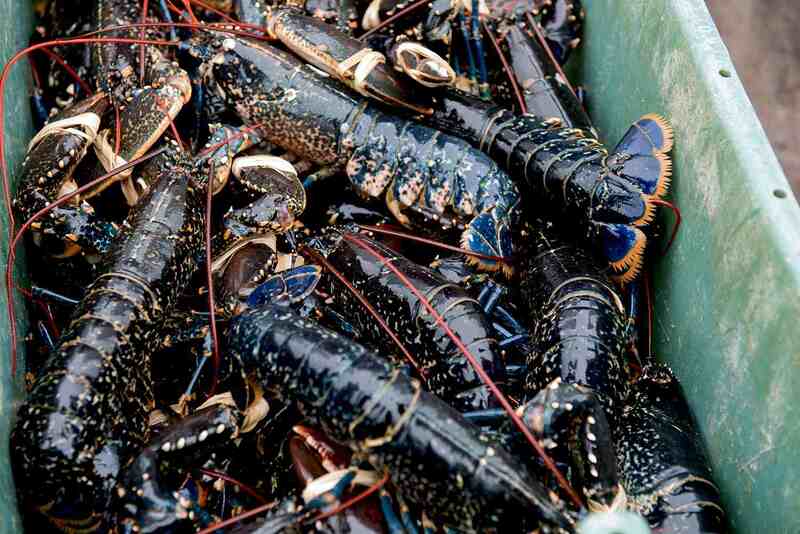 At this time, lobsters are more plentiful and meatier, have hard shells because they have not begun to molt, and there's less demand from tourists. During the early, chilly months of the year, lobsters become scarce as they move farther offshore and workers have a hard time fishing in the cold, sometimes stormy weather conditions. Because of this, prices are typically higher in January, February, and March, both for delivery and for locals. However, the prices then drop in late April, May, and early June. Lobsters typically range from 1 to 5 pounds, and a 1- to 2-pound lobster is typically sufficient for one person. Keep in mind that with lobsters, bigger is not necessarily better. Lobsters that weigh 3 pounds or more can be chewy and tough. Many New England lobster sellers offer packages including other New England Clambake fixings, such as chowder, steamers, and vegetables, so a petite lobster may be filling enough while satisfying a craving. Maine lobster delivery services ship live creatures. While the companies tend to have the practice down to a science, it's always possible that the lobster will not live through the trip or it will show up in a condition not appropriate for cooking. Before ordering, double-check the company's customer satisfaction terms and understand what the "return" policy covers. Live lobsters can't be dropped off on the front steps and left there until you get home from work. Ensure that someone is home to accept and sign for the package that will be delivered via overnight courier. If you want a lobster for tomorrow night's dinner, make sure to order in the morning, as orders typically cut off between 1 and 3 p.m. for next-day delivery. If possible, cook the lobsters the same day they are delivered for best results. If that's not an option, you can store them for up to 2 days. Wrap the lobsters in damp paper and keep them as cold as possible while surrounded by ice packs in the refrigerator. Don't freeze the lobsters, seal them in an airtight container, or put the creatures in tap water—they are saltwater creatures and will die in fresh water.